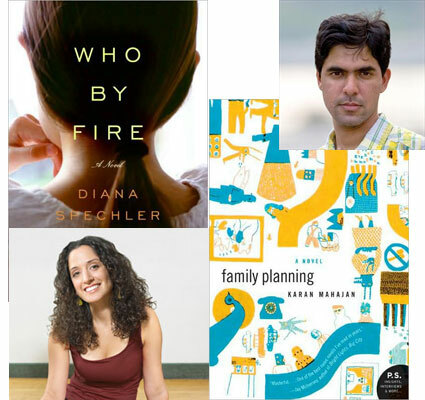 On Wednesday, February 11, Beatrice.com’s reading series for debut novelists, hosted by the Mercantile Library, continues with a joint appearance by Karan Mahajan (Family Planning) and Diana Spechler (Who By Fire). The reading starts at 7 p.m. at the Merc’s midtown headquarters (17 E 47th St); the authors will stick around to sign books during a wine reception. Karan Mahajan was born in 1984 and grew up in New Delhi. A graduate of Stanford University, he now lives in Brooklyn, New York. He was recently interviewed by GalleyCat’s Jason Boog. Diana Spechler’s fiction has appeared in Glimmer Train Stories, Moment, Lilith, and elsewhere. She received her MFA degree from the University of Montana and was a Steinbeck Fellow at San Jose State University. She lives in New York City, where she is at work on her second novel. AND: You’ll want to keep February 25 free for “mystery night” at the Merc, as we welcome Jedediah Berry and Paul Tremblay, with a special appearance by Alex Berenson. Sholom Aleichem may not be an name you recognize, but chances are you’re familiar with an adaptation of his work: Fiddler on the Roof is based on the novel Tevye the Dairyman, which has just been republished in a new Penguin Classics edition that also includes the novel Motl the Cantor’s Son. 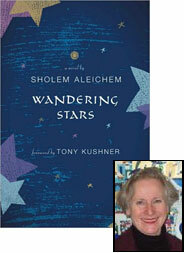 Both works have been newly translated from the Yiddish by Aliza Shevrin, who also did a new translation of Wandering Stars—restoring passages that had been cut from the previous English-language version from the 1950s as well as Aleichem’s original ending. With the 150th anniversary of Sholom Aleichem’s birth fast approaching, I wanted to learn more from Shevrin about what had drawn her to this author and his fiction. I am a performer of Sholom Aleichem. A musician has a score to read and perform from. An actor has a script to read and perform from. In both cases that performer interprets the script or score according to his or her artistic knowledge, background and the precedents of other artists. But he must always follow the original words or notes as written. And so it is with me. I have Sholom Aleichem’s words, my knowledge of the Yiddish language, one or two former translations, a lifetime of Yiddishkayt and Jewish idioms and history. I slowly, word by word, painstakingly plow through the books and hope to come up with what sounds as if it were written in English but is clearly the work of the author writing in Yiddish. My husband, also a native Yiddish speaker and himself a poet and novelist, is my in-house editor. My Yiddish is better than his and his English is better than mine. I do the first draft: looking up words in dictionaries, checking with other books and Yiddish speakers, etc. We then go over what I have done, sentence for sentence, to make sure I haven’t missed a nuance or have misinterpreted a word. We do this several times as I put in corrections on the computer where I have done the first translation head-on. Then he reads each chapter aloud, while I scan the Yiddish to make sure it sounds the way I want it to. This is how the final book evolves. I must say it gives me great creative pleasure. I am a frustrated actress and this provides me with a bit of narcissistic gratification as well as the hope that readers will learn more of Sholom Aleichem’s writings and the times he writes about.